Students in Cowley College’s Phi Theta Kappa Honor Society recently attended the Honors in Action Conference in Topeka, KS on November 6-8. Officers Samantha Twenhafel, Hannah Twenhafel, Taylor Swarts, Arnoldo Ruiz, and Sam McClaflin along with member Aishah Alhomsi and advisor Tiffany Corley met with regional officers, coordinators, alumni and advisors from all over Kansas and attended general sessions as well as breakout and seminar groups led by those individuals. Students in seminar groups focused on the regional Honors in Action project by making 30-second public service announcement videos to express their group’s view on the role of social media and technology in their lives. During breakout sessions, students learned about scholarship opportunities, membership recruitment, hallmark awards, and fundraising ideas. On Saturday, Nov. 7 students visited the Brown v Board of Education museum and the Ritchie House to learn about and discuss segregation and abolitionism. They also visited Washburn University for lunch and a tour of the campus. Sunday, Nov. 8 a life-coach, Sylvia Hall spoke to the students about energizing themselves, becoming leaders, and changing their perspectives. Between general and seminar sessions, the students enjoyed a Friday Night Fun Night presented by the regional officers and a dance after dinner on Saturday night. 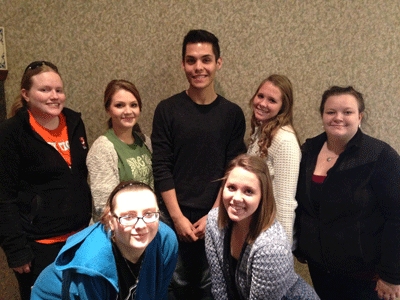 Pictured, front row from left, Advisor Tiffany Corley, Taylor Swarts, Arnoldo Ruiz, Hannah Twenhafel, and Sam McClaflin. And back row from left, Aishah Alhomsi, and Samantha Twenhafel.